I have asked in the past what the purpose of the debug console window it, and have gotten the answer "it is for displaying the debugger console". 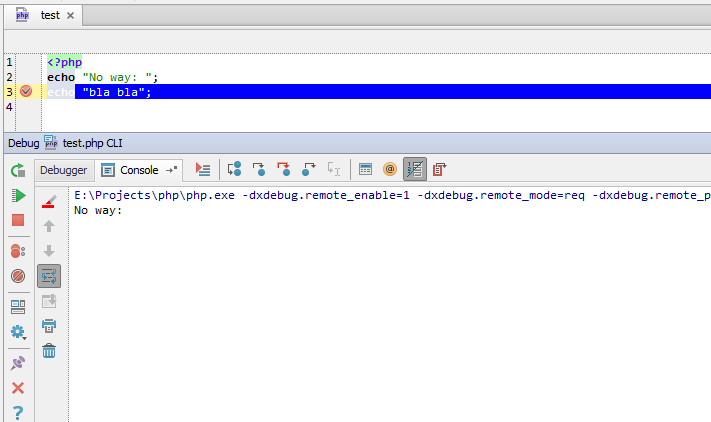 Since the console window is the default tab on the debug pane, I am assuming it provides useful functions. But I have never seen anything in it; nor does it allow entry. So I am asking what is it purpose and how is it used. I would hope someone can give an answer that either points me to the documentation, or gives a 1-2-3 on how it is used. PHP debugger. Just looking for some explanatory documentation, use cases, examples, tutorial. Anything but a big, white, blank window that seems to do nothing. Everyone must know how to use it except me. Sounds good. Except when I put an echo statement in, nothing displays in the console. Is there a buffering issue that has to be changed? What kind of script do you debug: CLI or web page? Console is for CLI mode as web page goes thorough your web server into your browser and not console. I rarely work with CLI, although on occasion I do.